Three faces have been pasted (old fashioned scissors and paste!) into the picture – the two characters directly behind Robert Fell and another standing at the back on the left. In August 2010 I established that the Census records for 1881/91/1901 indicate that the family lived at Somerville, 4 Hungerford Road, Lindley/Lockwood – a northern suburb of Huddersfield – just off the Halifax Road. 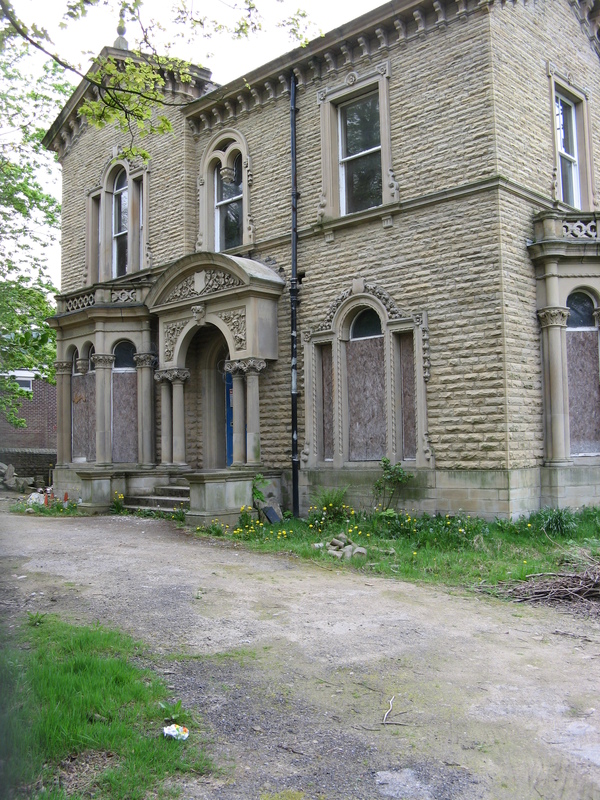 The description of the house (particularly the front entrance) in the Kirklees Council proposal for the Huddersfield Conservation Area matched the photograph. A visit to the area then confirmed that this photograph is of Somerville. I was then contacted by Don Hughes in Canada. He is the Great Grandson of Frederick Keighley Fell and thus a third cousin. Frederick Fell is one of Robert Fell’s children and is believed to have emigrated in 1899 to Quebec. After Don and I had established that we were related he then sent me a photograph asking me if I could identify it. It was from the same negative as the photograph at the top of this item. However we struggled to positively identify everyone in the photograph. 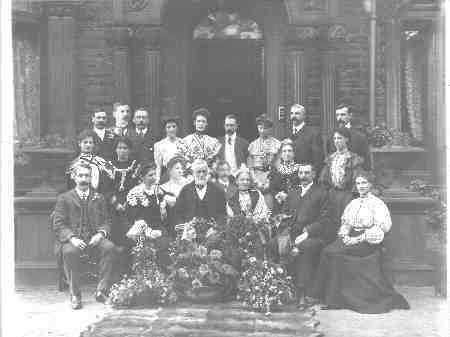 The 20th of September 1904 would have been Robert and Martha’s Golden Wedding anniversary. We were reasonably confident that the central characters are Robert and Martha Fell. From another photograph from Don, Frederick and his wife Catherine Graham are probably the pasted in figures behind Robert Fell – they are unlikely to have returned from Canada for the anniversary celebrations. After that it was pretty much guess work based on knowledge of the couples and their ages. In May 2017 I was contacted by Huddersfield Civic Society concerning some of the homes mentioned on this website. They are publishing a book, ‘The Villas of Edgerton: home to a Victorian elite’ in June 2017. A mile or so north-west of Huddersfield town centre, amongst dense tree cover along the main road to Halifax, lies the district of Edgerton. It is a remarkably well-preserved example of the Victorian villa suburb. Indeed the architectural historian of West Yorkshire, Derek Linstrum, suggests that Edgerton “can be recognised as the essence of the middle-class suburban ideal, in which buildings and settings merge into a picturesque whole which nevertheless respects each man’s individuality and privacy”…there have been only a handful of demolitions – unlike the much-celebrated Victoria Park in Manchester, or Adel in Leeds, Edgerton is very largely intact. They were interested in this picture of Somerville. This spurred me to try and find a member of the Fell Surname Line to try and get more details. I eventually made contact with Mr Harry Gillies Fell and he had a further copy of this photograph which includes his grandparents Henry (b 1859) and Helen Shelly Gillies (b 1861) Fell. He confirmed that it was a Golden Wedding photograph and his copy had the names written on the back. ¹ Martha’s sister being included and Robert Fell being unmarried at the time allows the number of people to be reconciled to the original supposition that the photo was probably of Robert and Martha Fell, their children and children-in-law. In 2008 the house was undergoing significant restoration (and extension to the rear). The urns seen flanking the entrance in the 1904 photograph had unfortunately been stolen. This post was originally written on 18 Aug 2010 and has been substantially revised in 2017.